Ramtech recently completed two next generation portable classrooms for the Eanes Independent School District located in Austin, Texas. The innovative modular building project was a collaborative effort led by Pfluger Architects which began by using our industry standard portable double classroom design, then modifying the interior and exterior in order to create a new type of instructional environment dubbed the ‘Learning Studio’. Ramtech manufactured and installed both modular buildings at the school district’s Cedar Creek Elementary school location. Each 1,536 square foot facility features a bank of three seven-foot tinted aluminum framed awning windows that allow for increased lighting and ventilation. The standard 2×4′ box lighting was replaced with linear pendant fixtures that provide both direct and indirect light creating a more natural light quality. The typical wall-mounted through wall HVAC units that can create unwanted noise were replaced with split systems with a closet mounted air handler, outside condenser unit, and exposed spiral duct. The interior space features smart boards on the walls and ample storage cabinetry in each Studio. The floor tile in the classroom space features J+J’s Kinetex textile composite flooring which provides a soft-surface with the longevity performance of hard-surface flooring. The typical standard lay-in ceiling was removed to reveal a painted wood sloped ceiling from the roof line with an exposed truss. The typical restrooms in each classroom were also replaced with a single bathroom accessed from the common area between rooms which includes enough space for small office equipment and storage racks. The exterior design of the Learning Studios allows for clustering of the buildings which makes a large exterior community courtyard possible. There are also oversized porches and stoops along with a connective decking system with seating steps that allows for student congregating or outside instruction. With school safety and security now of primary concern, the Learning Studio’s large windows allow for greater sightlines to monitor all movement around the area. The genesis of the portable classroom redesign began when Pfluger Architects collaborated with an exploratory committee of school district officials, principals, and community members within Eanes ISD to evaluate the district wide use of facilities as they related to budgets, programs, and enrollment. 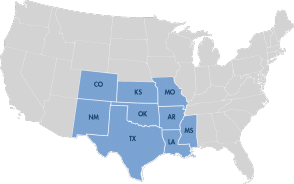 Like many school districts in Texas and around the country, they found that a significant portion of their portables that are used to meet shifting enrollments on their campuses were over 40 years old. 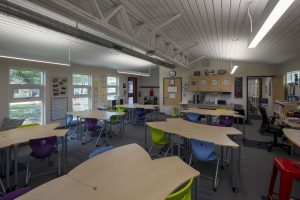 The goal for the Learning Studio was to create an instructional space that was equivalent or superior to a conventionally built classroom while providing an exceptional educational experience. A case study on the project is available for download on the Pfluger website here.